The moment millions of fans were waiting for finally arrived Monday night during Monday Night Football when the final trailer for 'Star Wars: The Force Awakens' debuted. It quickly became the number one trending topic on social media worldwide. The trailer featured the most new footage since the last trailer was released back in April. See it now for the first or one hundred and fiftieth time. The trailer certainly didn't disappoint as it featured characters old and new in a sweeping and dramatic sci-fi adventure with more clues to what the new chapter in Star Wars lore is all about. Kylo Ren (Adam Driver), in particular, seemed to be carrying the legacy of Darth Vader. Meanwhile, Han Solo (Harrison Ford) and Chewbacca (Peter Mayhew) are back in what appear to be significant roles as they meet Finn (John Boyega) and Rey (Daisy Ridley). A new trailer and the start of movie ticket sales seemed to be too much for some outlets as the demand overwhemled online sites causing crashes. And as with many major franchises some theaters are offering movie marathons leading to the latest sequel. That means you can see Episodes 1-6 and then Episode 7 "The Force Awakens" for one price with additional perks from participating theaters. 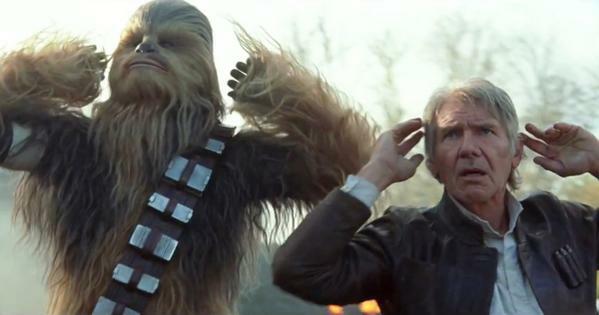 Of course, the trailer offered a lot of questions like a saddened Leia finding comfort on Han's chest but why? Why?! And where in the world is Luke Skywalker? In case you didn't already know 'Star Wars: The Force Awakens' hits theaters on December 18, 2015.